Avoid adding preservatives to extend the life of a food product. Most customers don't go for added preservatives. Seal your products with vacuum sealing machine and safeguard it from outside impurities like dust, heat, etc.. thereby extending your products' life. Even the customers need not refrigerate their food. This will also ensure that the product will not lose its flavor and taste that it got while cooking making your customers to buy more of these. In this vacuum sealer machine Orveds chamber machines are projected and manufactured to vacuum pack in bags, either inside or outside the vacuum chamber, and in containers. The vacuum chamber is completely stainless steel built, material which guarantees its robustness and durability for a long time ensuring your products will have long life. These can be used in restaurant and hotel kitchens, they can be easily used in all wholesale food activities (meat, sausage products, cheese, etc.) and in supermarkets. Orveds range of products is extremely rich and proposes various products, different in sizes, applications and characteristics. A food takes a lot of time to get prepared, it is very important to make sure that it survives till it get consumed. EXTENDED FOOD LIFE AND REDUCED PRODUCT LOSS: Many scientific studies have revealed that vacuum packaging will increase the life of a product from 50%-400%. This will also make sure that unsold food products have more time to get sold. RETAIN THE FLAVORS AND THE SMELL OF THE FOOD ITEM: The vacuum packaging will also ensure that the food will retain its flavor and smell for a long period of time giving the customers the cushion of not worrying about its quality. NO CHEMICAL PRESERVATIVES NEEDED: Vacuum makes sure that your food stays safe and consumable for longer time that usual. So, you need not add any chemical preservatives to the products. Statistically customers preserve food that have no chemicals in it. 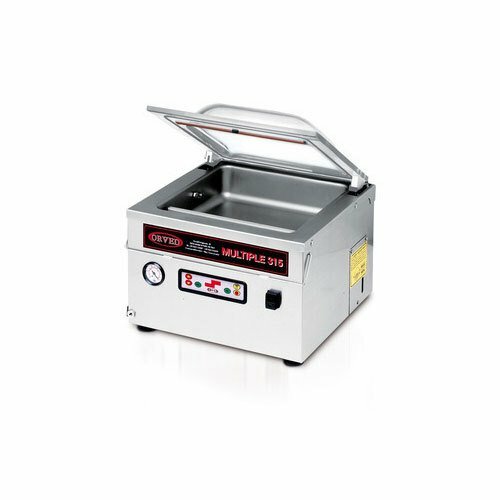 MACHINE SPECIFICATIONS: This vacuum packaging machine has a standard 12 inch sealing beam and is made of stainless steel material which accounts for its durability and comes with 1 year parts and labor warranty and the product is made in Italy. BAG TYPE: SB, SCB, CB and CCB Container compatible Internal & external vacuuming. If you have any questions about this product by Eurodib, contact us by completing and submitting the form below. If you are looking for a specif part number, please include it with your message. Dehydrator For Fuits And Vegetables .